We feel the presence of children in worship is a gift from our Lord, and a reminder that our parish is growing. Any noise that our children may make during the Divine Liturgy is pleasing to God’s ears, and welcomed! Please greet our children and young families with smiles and encouragement. And remember that the way we welcome children in the Church directly affects the way they respond to the Church, to God, and to one another. Let them know that they are welcome, and loved, and at home in our parish. Relax! God put the wiggle in children; don’t feel that you must suppress it in God’s house. All are welcome. 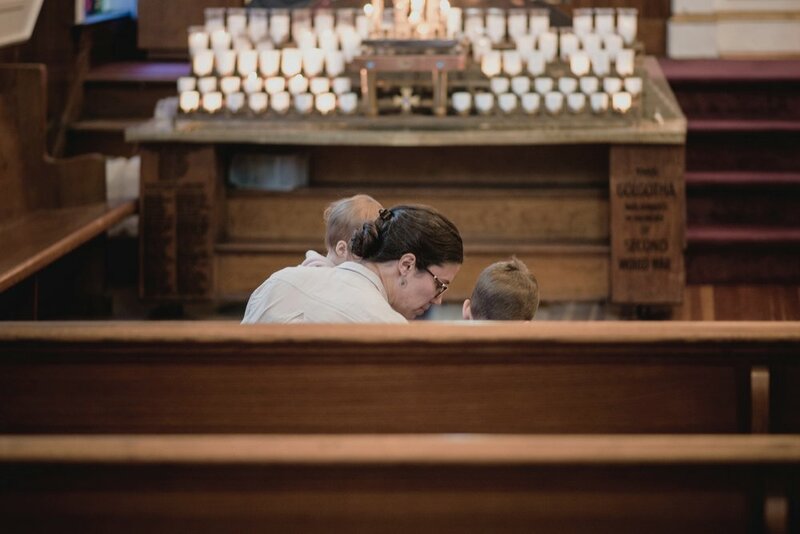 Sit toward the front where it is easier for your little ones to see and hear what is going on in the Altar. They are tired of seeing the backs of others’ heads. Quietly explain the parts of the Divine Liturgy, actions of the priest, deacon, altar servers, choir, etc. Sing the hymns, pray, make the Sign of the Cross. Children learn liturgical behavior by copying you. If you have to step out of the Church during the Divine Liturgy, feel free to do so, but please come back. Or better yet, bring them to the different icons around the church and talk to them about what they see. Thank you for being with us today in worship! We have put a special Liturgy book in the pews just for you. See if you can follow along with the Divine Liturgy.